Wisebox™, a fully owned subsidiary and division of the i-Open Technologies Group of companies, expands with the acquisition of Chilliwack-based Cnawlece Inc.
Mission, BC, July 23, 2018 — Wisebox™, a business process automation solution, has announced the acquisition of Cnawlece Incorporated, a database and web portal solution provider based in Chilliwack, British Columbia. 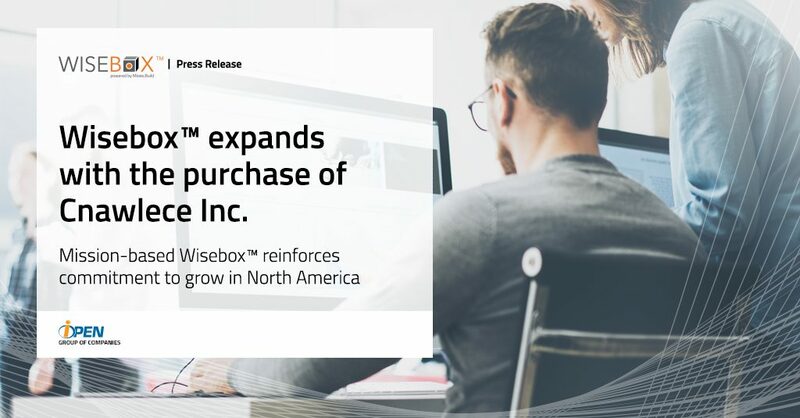 The acquisition of Cnawlece positions Wisebox as the clear market share leader for full-cycle business process automation with cloud ERP, CRM, database, invoicing, reporting, scheduling, and mobile functionality in the Fraser Valley and its surrounding regions. “The acquisition of Cnawlece by Wisebox is a tremendous opportunity for our staff and customers alike. This investment by the i-Open Technologies Group allows us to facilitate the required financing, senior management expertise, infrastructure, and re-sources to propel Wisebox to the next level of desired growth and expansion. We have been eager and exploring such an alignment for our proven technology and our business model for delivering high-quality business automation solutions. I am excited about the platform this investment provides our team for scaling and accelerating our growth.” says Colin Schmidt, founder and CEO of Cnawlece Incorporated. Cnawlece Incorporated is Wisebox’s first acquisition and is the i-Open Group’s fourth in Canada. Wisebox’s expansion mindset, in combination with i-Open Group’s commitment to adding to its comprehensive software portfolio, has fueled i-Open’s revenue, workforce, and new client growth year over year. Wisebox will continue to support the organization’s Moxie.Build database and web portal solutions. Clients will receive the same level of exceptional service under the Wisebox brand. The i-Open Technologies Group of companies, established in 2002, is a Geospatial Technology solution leader. After a decade of success and a number of recent acquisitions, i-Open has grown into an international geospatial technology provider, partnering with some of the largest energy sector companies, municipal and provincial governments, transportation, and commercial real-estate firms worldwide. i-Open and its subsidiaries help drive business transformation for its clients with solutions for enriching business process automation, achieving operational efficiencies, spatially aware asset tracking, and enterprise-wide cost reductions. Founded in 2004 by Colin Schmidt, with roots back to his first commercial software built in 1995, the organization has grown to be one of North America’s largest non-profit and enterprise providers of web portals and databases. Dozens of Cnawlece customers include businesses of all sizes: small, medium, and enterprise. Our for-profit customers utilize Moxie.Build for their primary websites, product catalogs, knowledge bases, and customer portals that manage workflows to keep the customer in the loop. We are passionate about empowering our client’s customers to get things done, now, not later. A well-established leader in the development & implementation of Spatially Enabled Applications. At i-Open Technologies we recognize the importance of protecting your personal information and are committed to processing it responsibly and in compliance with applicable data protection laws in all countries in which i-Open Technologies operates. This Privacy Statement describes i-Open Technologies’ general privacy practices that apply to personal information we collect, use and share about consumers and other individuals within our clients, business partners, supplier and other organizations with which i-Open Technologies has or contemplates a business relationship. We may provide additional or more specific information on the collection or use of personal information on websites or related to a specific product or service.